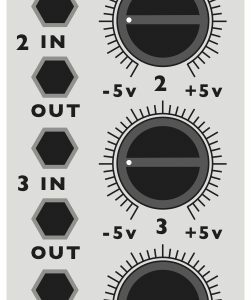 The VCOb is an voltage-controlled analog oscillator based around a classic triangle core VCO. It is similar to the uLFO, but with some improvemnets. 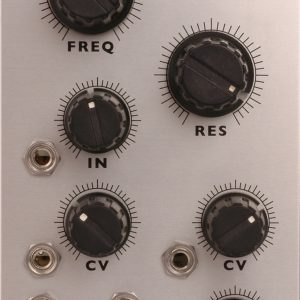 The range of the VCOb is one of the widest in the analog modular world. And like all triangle cores the real fun is in the FM. Since we’re starting with a triangle core it’s easy to produce a real Sine wave output. 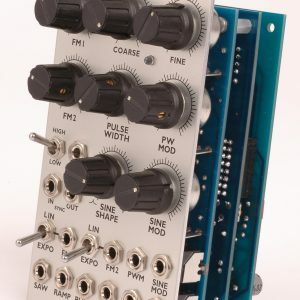 There is also a Saw and Pulse outputs. The Pulse will almost become fully positive or negative with the pot, and will go all the way open and closed with CV. The VCOb offers FM in both the Linear And Exponential varieties. There is only one input, unlike the uLFO. and the FM set to full in Expo mode this will act as a second 1V/Oct input for things like transposing. 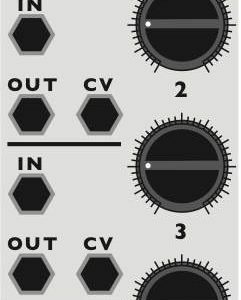 The tracking is all analog and will give 4-6 octaves, depending on how picky you are. It is very stable and they do track together very well.